Give 'em the brush off. These days, having both hands free to clean bottles - or do anything, really - is a luxury. But now there's a smart way to keep one hand free as you work through the huge pile of bottles that accumulates by the end of the night. With the Munchkin Soap™ Dispensing Bottle Brush, all you need is one hand to squirt soap and scrub - allowing you to keep your eye (and your other hand) fully on your wandering little squirt. Just one push of a button releases soap through the bristles, allowing you to suds up quickly without ever removing your hand from the brush. 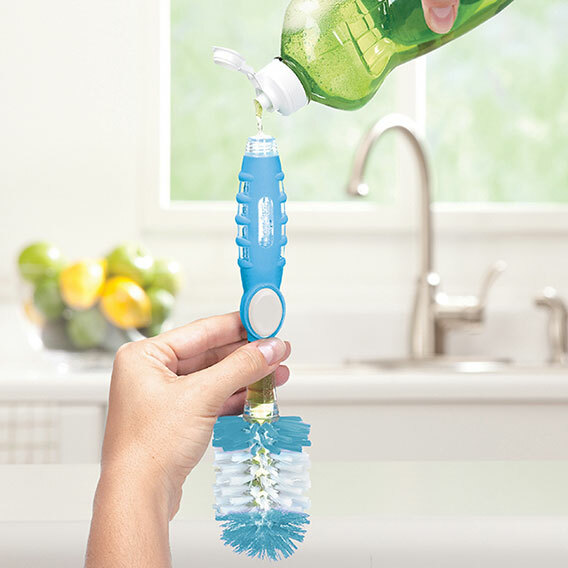 The durable scrubbing bristles reach hard-to-clean areas of bottles and cups, but are soft enough to ensure a scratch-free finish. Munchkin's patented suction cup base is designed to attach upright on your countertop, allowing bristles to dry quickly and keeping your brush away from household germs. Think of this double-duty brush as your right hand during your daily bottle washing routine.